Peggy Klaus wins the 2016 Stevie Gold Award for Coach of the Year, Women in Business! (Photo: Business Wire). 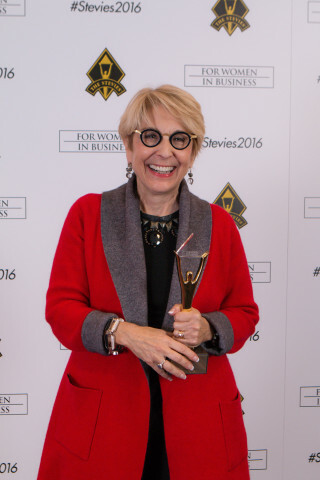 NEW YORK--(BUSINESS WIRE)--Peggy Klaus has won a Gold Stevie® Award for Coach of the Year in the 13th annual Stevie Awards for Women in Business. She also picked up a Bronze for Woman of the Year in Business Services. The Stevie Awards are the world’s top honors for female entrepreneurs, executives, employees and the organizations they run. All individuals and organizations worldwide are eligible to submit nominations – public and private, for-profit and non-profit, large and small. The 2016 awards received entries from 31 nations and territories. Klaus’s coaching career began in 1991, when she was caring for a dying friend. This experience inspired Klaus – already a successful actor, producer, talent coach and director, with Paramount Pictures, NBC, and Warner Brothers on her resume – to create a coaching program to help doctors better communicate with patients. Two years and many hospitals later, Klaus shifted her prodigious energy and expert Hollywood skill-set to executives. Friends climbing the corporate ladder were asking her for communication and presentation training, and she fast became one of the country’s top executive coaches, with clients like JP Morgan Chase, the NFL, Gap, Goldman Sachs, and Johnson & Johnson. At the core of the Klaus oeuvre is behavioral change. But results are what prompt companies to ask her back again and again. Take, for instance, the executives terrified after a sudden sale of their company. Or the “high-potential hire” who didn’t get along with people. Or the executive who didn’t trust her instincts or value – until Klaus came along. And so does a career that tops the charts for 23 years.